Manchester-based composer, Michael Betteridge, hwas commissioned to write a brand new piece featuring young musicians from across Greater Manchester for the Opening Weekend of The Stoller Hall on Saturday 22 April, 2017. 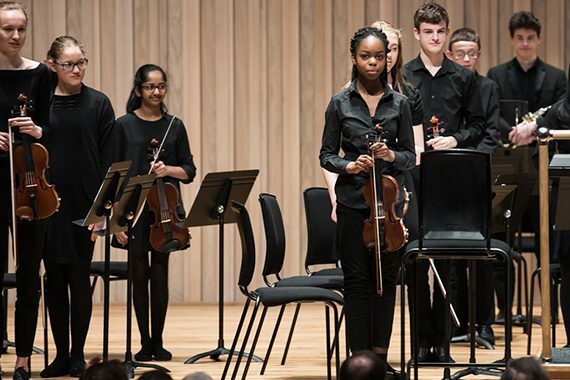 In collaboration with the Greater Manchester Music Education Hub and MyHub, each Greater Manchester borough nominated young instrumentalists to play a part in performing this bespoke composition onstage in The Stoller Hall. The players rehearsed the piece in their local area centres before coming together as one ensemble for final rehearsals ahead of the performance. Michael is a very successful young composer who is passionate about music education and participant-led work. As well as a composer, he is a very experienced workshop leader, animateur and conductor who has previously worked with Chetham’s, The Bridgewater Hall and HOME, among many others, on a diverse range of music outreach projects.